The Trenches of Discovery: Working hard or hardly working? 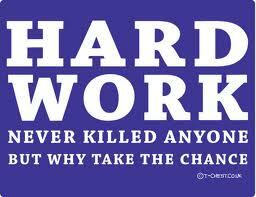 "Life grants nothing to us mortals without hard work." So said Horace, the Roman lyric poet, over two millennia ago and little has changed since. I am currently one to attest to that sentiment as I am in the middle of writing up my PhD thesis and have accordingly developed the peculiar mania that grips many students at this stage in their degree where non-thesis pursuits become shamefully wasteful or even patently corrosive of your time! So, I'm afraid that this week's post from me is just a brief one, and the long-promised 'human machine' edition on stem cells is being pushed back yet again, apologies. In light of this sudden idiopathic workaholism that overtaken me, it seems appropriate that my post this week be on the subject of how hard scientists work. Coming into science I knew that the pay is generally crap, and it's not particularly glamorous, and you have to look for a new job every three years until you settle down with your own cosy lab somewhere - but at least it's a fairly nice lifestyle, right? Well yes and no. I love the academic lifestyle - it's the right mix of individual freedom and motivating challenges, by which I mean that it isn't too stressful but isn't boring either. That has been my experience (present situation excluded), but a recent report from the University of Nottingham suggests that I may have been one of the lucky ones, or perhaps that things are going to worsen for me! The report (available here) looked at the working hours of conservation scientists in several countries by analysing the time and day of 25,000 publication submissions to the journal Biological Conservation. It's true that this is not, perhaps, the most reliable indicator of general working patterns since people tend to put in extra hours in the run-up to publication, but the results are still intriguing nonetheless. The long and the short of their findings are that scientists, basically, work pretty damn hard (well, conservation biologists at least). They observed that 16% of manuscripts were submitted late at night, and 12% were submitted at weekends, and that the proportion of work submitted outside of normal hours has been increasing ~5% each year. This paints a fairly bleak picture for the future if working hours are going to stretch further and further into personal time. Perhaps unsurprisingly, the study also found significant differences in working habits between different countries. The countries whose scientists seem to work the most unsociable hours are Japan and Mexico, who seem to work late (~30% manuscripts submitted out of hours on weekdays), as well as China and India, who work weekends a lot (up to 40% submitted at weekends). The most relaxed scientists were found in Belgium and Norway, who like their weekends off (~5% submitted on weekends), as well as South Africa and Finland, who go home at 5 (less than 10% submitted after hours on weekdays) - thus explaining Shaun's abrupt move to Helsinki three years ago! British and American scientists were about average in their working habits. "We call for academic institutions to remember that good science requires time to read and think and over-stressed scientists are likely to be less productive overall. We also recommend that peer-review activities are included as part of the academic job description and considered in staff performance evaluations. At the end of the day, working on this paper has been an opportunity to reflect about our own behaviour and priorities. Next time I go to Bali, I will spend more time swimming and talking with my wife and less working on manuscripts." Why so many scientists are willing to put up with the current situation is perhaps the more informative question. People become scientists often because of a burning curiosity that they must fulfil, and the realisation of that goal is its own reward. In many ways, academic science is an indulgence that most other professions wouldn't tolerate. Researchers are, by and large, able to investigate whatever they're interested in, in whatever way they see fit. Clearly, dead-end research is eventually weeded out by funding bodies (*all hail the funding bodies*) but generally it's fairly flexible and if you're interested in something and stick in science then there's a good chance you'll end up working on it. As well as this, there is the feeling that you are contributing to something bigger than yourself. Research never disappears, it will outlive you and become your legacy once you're just a memory. This is the same sensation that artists must get when creating their masterpiece, or writers have as they pen their latest novel. Moreover, if your research is useful then it can have ramifications far beyond anything you could achieve in most other jobs, but even if it's not then you're still helping to take one more step along the path of human progress. This is why people chose to be scientists and work unreasonable hours for a lot less money than an investment banker, and it's why I would always encourage anyone who is interesting in entering science as a career. So, Horace was right, life gives you nothing without hard work, but then if that work is intoxicating enough then life begins to mean nothing without it either. There's an assumption being made that the conservation researchers who submit papers "after hours" are also working "during hours". Some people in our department don't get in until midday and leave tomorrow. Also, Finns don't go home at 5pm, they go home at 4pm. The working day here is 8am-4pm. Finns need to be home for dinner at 4:30pm. There are many assumptions being made here, you've hit on one though. Also, there's an inherent bias that the people who work harder will publish more often and so contribute more to the statistics in this study. Nonetheless, it's an interesting result. Of course, Finns have to be home for their first long drink of the evening by 4:30 otherwise they get cranky! Nah, long drink is just for sophisticated foreigners when they visit Finland for important international sporting events (e.g. this summer's Roman Threes tournament).